Andrea Hayes and David Torpey. Photo: Mark Condren. TV3 star Andrea Hayes has spoken of how she didn't think she'd have a second baby when doctors turned her away from IVF. 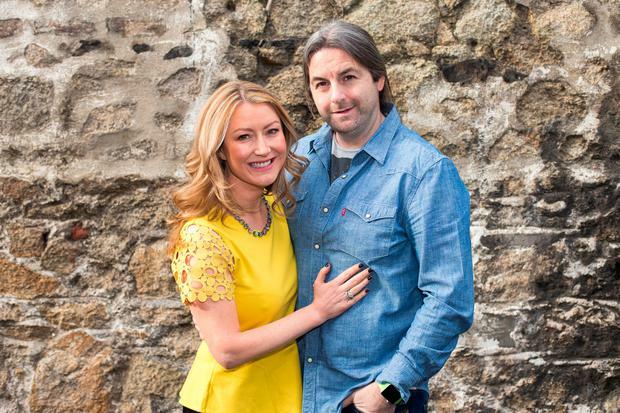 The TV3 presenter gave birth to her second daughter Skylar Grace Torpey last week. Andrea had previously referred to her as her “rainbow baby”, because she'd suffered the heartbreak of three miscarriages - two in one year. “Our hearts are wrapped around our new arrival,” she wrote on Instagram last week. Today, Hayes told Evoke.ie that she felt like she was “a miracle” because she Skylar was conceived naturally after a long road of health issues and multiple miscarriages. Hayes was diagnosed in 2015 with the rare brain condition, Chiari malformation type 1. Previously, Hayes spoke about how her work with rescue dogs at Dog's Trust helped her through difficult times and the pain of suffering three miscarriages. When she became pregnant with Skylar, the emotional scars of her previous miscarriages made it difficult for her to celebrate, she said. “I have finally reached my milestone three months," she said last October. "I know I should be basking in happiness and that wonderful pregnancy glow but instead I am feeling very anxious and almost nervous of what tomorrow could bring,” she revealed in the Irish Mail on Sunday. “Our journey to this point was not an easy one, every step with my current pregnancy just reminded me of the pain I felt this time last year as I went with high hopes to Holles Street for my routine eight-week scan,” she said.